Baked treats made with avocado are surprisingly rich and delicious. 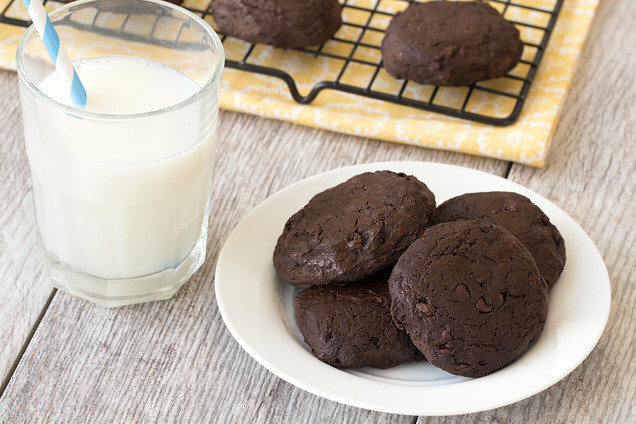 These cookies are fudgy, yummy, and don't taste anything like avocado... Promise! Wanna see how they're made? Watch this! Preheat oven to 350 degrees. Line a baking sheet with wax or parchment paper. In a small blender or food processor, purée avocado until smooth. In a medium-large bowl, combine puréed avocado, egg whites/substitute, sweetener, pumpkin, and vanilla extract. Whisk until uniform. Gradually stir in cocoa powder, flour, and baking soda. Stir until just mixed and uniform. Evenly distribute mixture into 12 mounds on the baking sheet, about 1 1/2 tbsp. each. Use the back of a spoon to spread and flatten into 2-inch circles. HG FYI: Truvia spoonable calorie-free sweetener is about twice as sweet as sugar. If using a no-calorie granulated sweetener that measures cup-for-cup like sugar instead of Truvia, double the amount called for in this recipe. Hungry for More Better-for-You Baked Goods? It's National Strawberry Shortcake Day, June 14th. Make yours by layering slices of angel food cake and strawberries with natural light whipped topping like So Delicious CocoWhip! Light. You know your pals would love this recipe... Click "Send to a Friend" now!